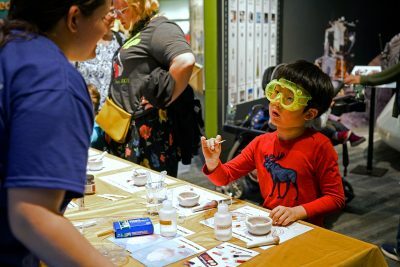 As Boston Marathon athletes prepared for their race, volunteers, guest speakers and staff members at the Museum of Science in the West End hosted a series of educational activities leading up to Monday’s headline event. In honor of the Boston Marathon, MOS recently partnered with the Boston Athletic Association to show what it takes to train for and run a marathon as part of the Cambridge Science Festival. Over the past two weekends, the museum offered four marathon-related interpretations of some of its permanent exhibits, as well as four presentations to highlight the different scientific aspects of a marathon, such as training and nutrition. On Monday, the museum also hosted a live screening of the race on their Gordon Current Science and Technology Center Stage. Matt Pacewicz, a program presenter at MOS, said the museum had a team running in the Marathon this year that raised money for the museum’s Traveling Programs. Since 2010, teams of runners have helped fund the expansion of these programs, which visit schools, camps and libraries throughout New England. Pacewicz helped lead an activity called “Tracking the Runners,” which was an interpretation of the museum’s permanent transportation exhibit. He explained there are several electronic checkpoints placed on the ground throughout the marathon course. Each athlete’s bib contains a small, disposable microchip that records their location when they pass over a checkpoint, he said, and the technology lets the Boston Athletic Association track more than 25,000 marathon participants. “This helps cut down on issues of cheating because otherwise people could start the marathon and then jump on the T,” Pacewicz said. Another activity called “How Would T. Rex Run a Marathon?” was set up in the museum’s permanent “Dinosaurs: Modeling the Mesozoic” exhibit. Visitors could run in the footsteps of dinosaurs on a model trackway and compare their jumping abilities with different animals on a jumping track. Rachel Cilley, a MOS staff member who helped lead this activity, used fossilized dinosaur footprints to explain how understandings of dinosaur locomotion have changed over time. “At first, scientists believed dinosaurs walked upright, but with new discoveries and evidence, it seems that they walked more parallel to the ground,” Cilley said. Guest speakers also gave presentations about the evolutionary science behind running. In “The Evolution of Running,” Jeremy DeSilva of Dartmouth College explained fossil evidence shows how humans have become good at long-distance running over time. In “Running Out of Africa,” Adam Van Arsdale of Wellesley College discussed the relationship between running and the migration of ancient humans from the African continent. In the museum’s permanent “Hall of Human Life” exhibit, staff also led a variety of biology education activities. Topics of discussion included how much air human lungs can hold and how running a marathon can change that, as well as explaining how energy drinks work. Erin Condon, a junior in the College of Arts and Sciences, ran in the Boston Marathon for the first time this year and said she noticed specific biological effects while training. Condon said as she has been running since she was 14 years old, she knows how to care of her body before while training. She said she used energy drinks before her runs and fuels up with foods such as dried fruit, chocolate and nuts at the halfway point of practice runs. She would also wait about 48 hours before running again, she said, so she could recharge.